EISA provided capacity building workshops to communities at grassroots level as well as to women in positions of leadership at local level. In collaboration with UNFPA Madagascar, EISA facilitated workshops in the Comoros for women who declared their intention for standing as candidates for future presidential and legislative elections in the Comoros. 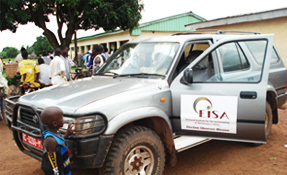 EISA undertook a partnership with the NGO SAHA, an organisation working primarily amongst rural women, using the EISA training material and facilitators and funded by the Swiss Agency for Development and Cooperation (SDC). Capacity building workshops for women already in decision-making positions were held for 90 participants to reinforce their capacity and provide additional skills and knowledge on budgeting oversight, leadership and management. The success of the programmes conducted in Madagascar resulted in an invitation by UNFPA Comoros to conceptualise and conduct training in a similar programme for Comorian women candidates in November 2009 in Moroni with 30 women from three islands of the country. Some of the participants were political party candidates, while others competed as independent candidates for the National Assembly elections held in December 2009. The workshop elicited great interest and EISA will be conducting further workshops in 2010 as well as a train the trainer course. These interventions highlighted that at the heart of the under-representation of women in politics are age old stereotypes and attitudes that assign women to the private and men to the public domain. In varying degrees these perceptions are reinforced by custom, culture, religion and even the media.Through these programmes EISA is slowly working at changing the perception of the traditional stereotype about the role of women in society. The content of these workshops enabled women to review how they contribute to these stereotypes and to create space for women to develop appropriate skills, and engage in the discussion and debate around the barriers that inhibit the progress of women to actively play a part at all levels of government and society.